I love this look simply because it is a combination of two different styles which I love. 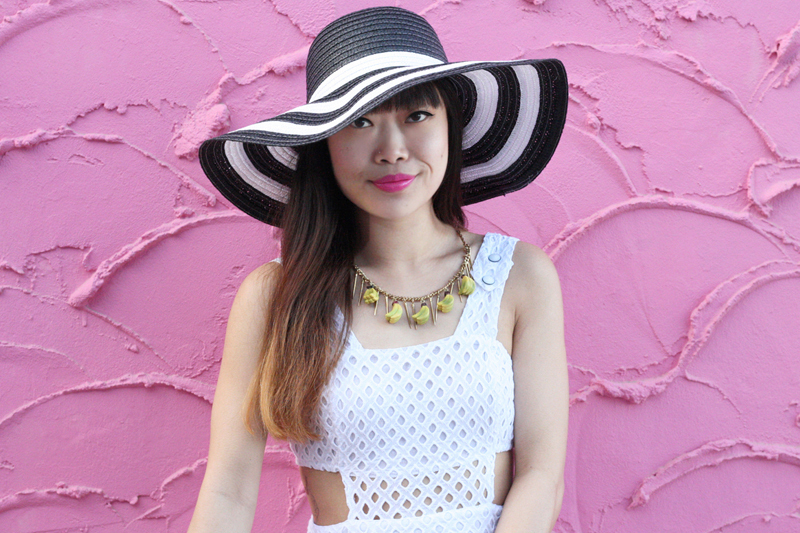 I am so obsessed with this eyelet cut out dress gifted by GoJane. The white and eyelet are feminine and delicate while the cut out is flirty and edgy. It is such a lovely piece and it fits like a dream! I wore a bright pink lip cream to match this awesome pink building and a statement black and white striped floppy hat for bold contrast. Lastly, I gave this black and white look a pop of color with a yellow satchel and the amazing Lulu Frost banana necklace that screams anything but summer! Eyelet cut out dress by Rehab c/o GoJane. 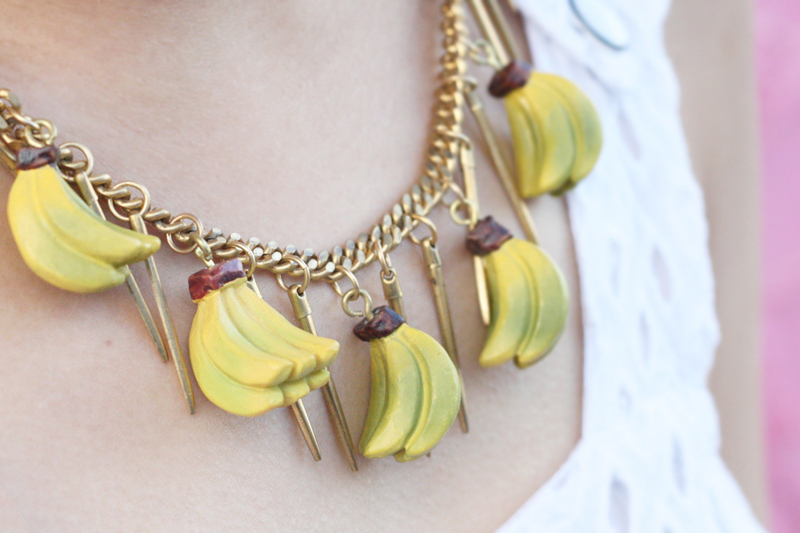 Banana necklace by Lulu Frost. Thrifted vintage black and white striped floppy hat. Yellow satchel from Hong Kong. the banana necklace is awesome. It reminds me of Donkey Kong. 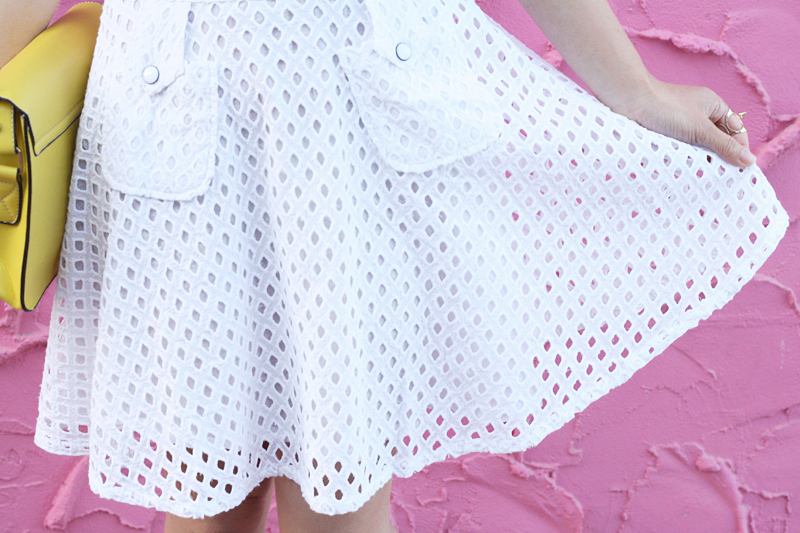 You look so awesome in our eyelet dress! what a fun wall! looks like frosting<3 your banana necklace is too cute! I love this dress! It looks like the perfect summer dress to stay cool in. I liked how you paired it with pops of yellow.